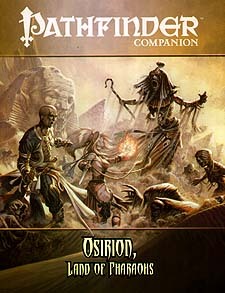 Covered by shifting desert sands and rules by a pharaoh who binds the very elements to his will, Osirion is a land of ancient mystery. Inside its weathered pyramids and ruined temples, mummies, curses, and worse horrors guard the opulent tombs of long-dead god-kings against thieves of all sorts. Now, with the Ruby Prince opening some of the nation's most famous and deadly locations to exploration, adventurers and scholars from across the world are converging on Osirion to make their fortunes or die trying. Do you have what it takes to master the secrets of the past!